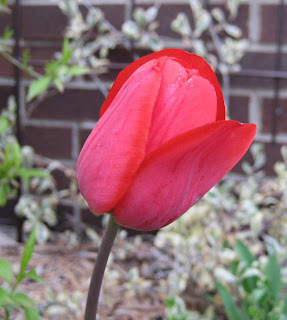 I was startled the other day to find this red tulip blooming in my front flower bed. Goodness sakes, I thought, where did that come from? It was really quite shockingly red, and a bit disturbing in a bed otherwise filled with calm pastel and white spring flowers. I immediately thought of names for this tulip like Red Harlot or Tulip Tart, neither of which is all that flattering. But really, that is quite RED, is it not? So, I'm asking myself, where did I get this tulip, in a color I wouldn't normally buy? Where? And what is its real name? Yes, I have a garden journal and I generally write down what I plant and where, but I failed to do that when I planted bulbs. So I don't know if I planted it last fall, but I must have because I don't think I've seen it before. Maybe it was a mix-up in the packaging? Maybe this is supposed to be a white or pink or purple tulip? Regardless of how it came to be planted there, I have it now, so I'll let it stay. But I think next year when it blooms, I'm going to cut it and bring it inside right away. After all, I don't want the neighbors to see that tart in my garden. 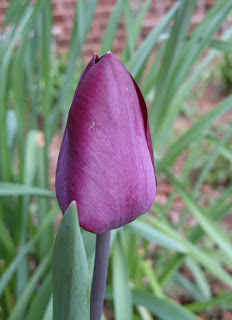 I'd rather they see tulips like this dark purple one blooming near the red tulip. That's more what I like. It is almost a royal purple, so I'm calling it Purple Queen of the Garden. Of course, if anyone thinks they know the true names of these tulips, let me know. I usually like to know the real names of my plants, really I do. That red tulip would fit in great with my spring garden. It is good to know the names of the plants you grow, but I like the way you name them. I am mainly a vegetable guy and my wife is more a flower and herb gardener (I know that is stereotypical) so I always forget the names of the flowers in our garden. Pam/Digging... I'd send this one to you but tulips don't do well in Austin, right?! Marc... You're on your own if your wife doesn't like the names you give her flowers! Pinks and purples are favorites in my garden too, but I always make exceptions for tulips. The red ones are so pretty. It's quite pretty that red tulip although I like the purple one better. 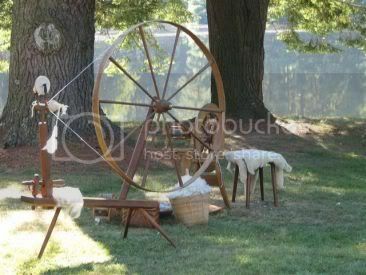 I hope proud Guinevere will return next spring in all her glory! I like that tarts and hoes comment. I don't know the name of the tulip but I would like to call it Scarlet, because it stood out from all the other tulips and got your attention and you seen a bit disturbed by it. I think you should plant a black one right next to it and call it Rhett. If it is a BIG red tulip, it may be red emperor. I love that purple one, just beautiful! Isn't the violet one called Arabian Mystery? I am not sure because I think Arabian Mystery is white at the edges of the petals and I can't see if yours will be white there, too.